It’s that time of year again! Christmas parties with family, friends and church, and a lot of potluck. When I’m asked to bring a dish, I usually go with dessert because that is my comfort zone but I have wanted to branch out and do the salad scene. I love salads, but it seems at least to me that there is only a few salads out there that we all take to the parties, like; green salad, broccoli, jello and pasta. I have been on a mission to find something different. Since I love caramel this was my first stop! What I love about this is that it looks like all the salads that you usually see on the table at many gatherings but once you dig in there is so many different flavors going on that you will be hooked! Pretzels: Preheat the oven to 400 degrees. In a small bowl, mix together the chopped pretzels, pecans, brown sugar, and melted butter. Place a piece of parchment paper onto a baking sheet and then spread out the mixture onto the pan. Bake for about 7 minutes. Let cool and then break it into small pieces. 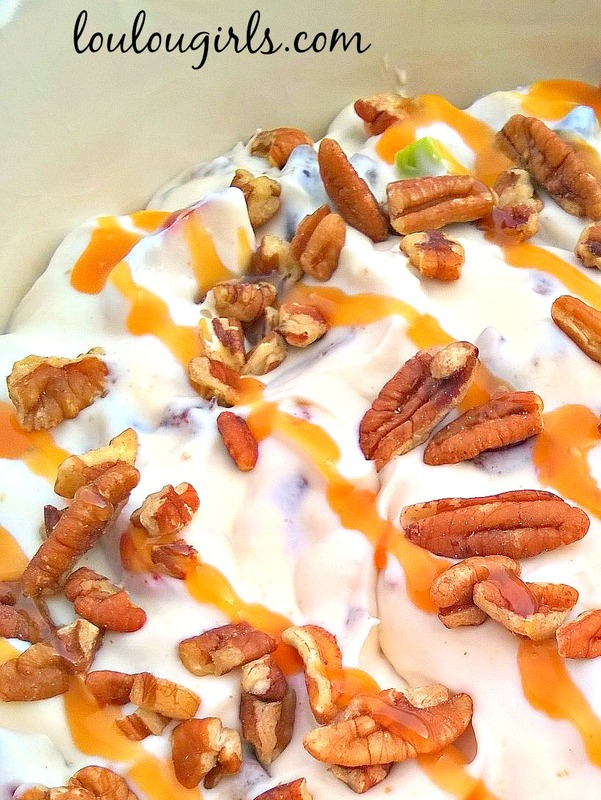 Cream cheese: In a large bowl, combine the cream cheese and caramel sauce until smooth. Fold in the Cool Whip. Stir in the diced apples and the pretzel mixture. 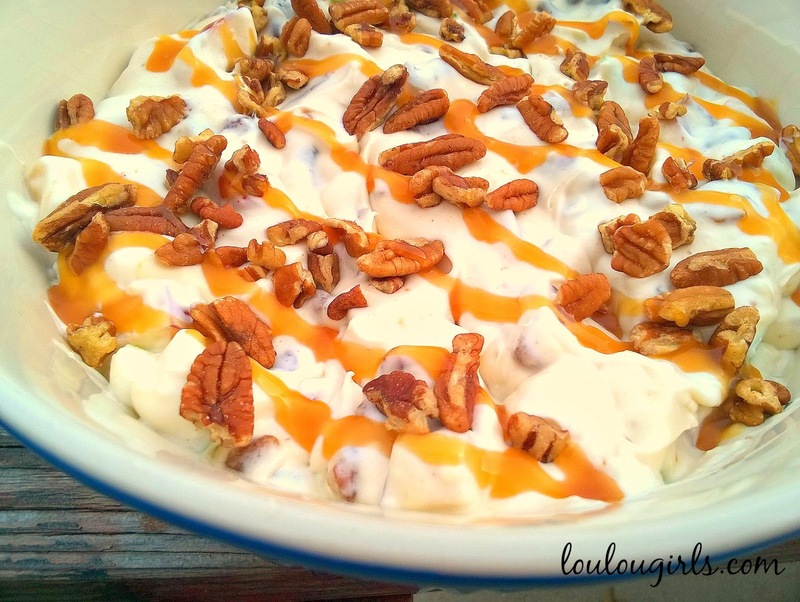 Garnish with a handful of pecans and drizzle with caramel. Check in later today for another salad idea! Yummy! I love caramel too, so this looks great! Kimberly, this looks so good! I bet it would go over great at a holiday buffet or pot-luck, the kids would love it. That is if they could get past the parents to get a spoonful! LOL Happy Holidays!! 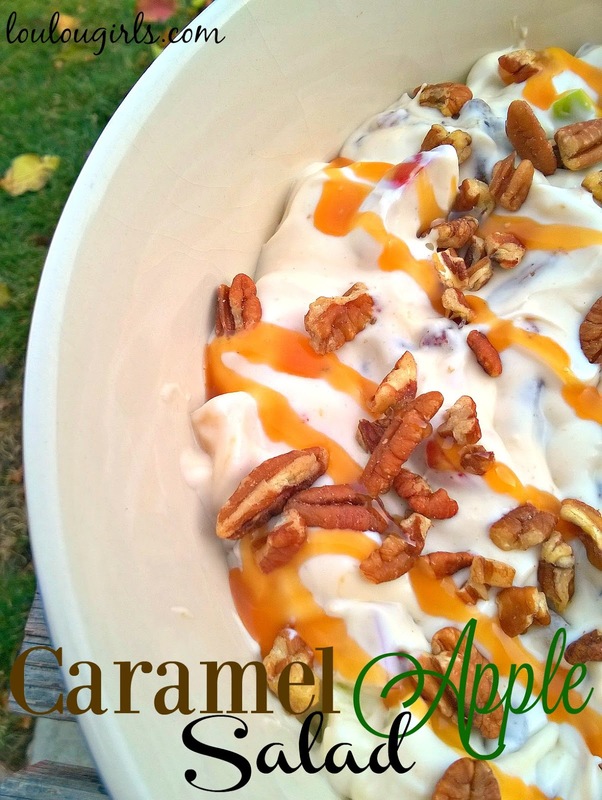 I am surly drooling over this Caramel Apple Salad, it is fantastic! Thanks so much for sharing your post with us at Full Plate Thursday and have a great day. Oh my goodness! I could devour this all! Congrats on your #HomeMattersParty feature. Looks delicious, thanks for sharing with Hearth and soul blog hop, pinning.